The Cottonmouth Snake (Agkistrodon piscivorus) is also known as the water moccasin, the black moccasin and the black snake. The name cottonmouth comes from the fact that its mouth looks like cotton when it is open. The Cottonmouth Snake has been considered aggressive, however, studies have shown that this is not necessarily true. The Cottonmouth Snake is one of the most common snakes in Florida. Other Florida Snakes includes the Florida cottonmouth, Western cottonmouth and the Eastern cottonmouth. The Cottonmouth Snake is the largest species of the genus Agkistrodon. Adult Cottonmouth Snakes commonly exceed 80 centimetres in length, with males growing larger than females. Cottonmouth Snakes have a heavy body with a moderately long tail. 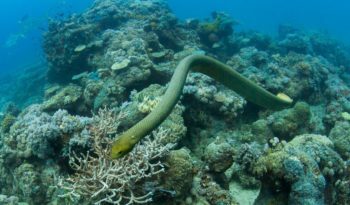 Occasionally, individuals may exceed 180 centimetres in length, especially in the eastern part of their range. Cottonmouth Snakes are large, aquatic, venomous snakes. Cottonmouth Snakes are generally dark coloured with tones of olive, brown or black. A lighter/darker cross banding pattern may be seen, especially on their sides. The dorsal banding pattern fades with age, so that older individuals are an almost uniform olive brown, greyish brown or black. Their belly is white, yellowish white or tan, marked with dark spots and becomes darker near their posterior. The amount of dark pigment on the belly varies from virtually nothing to almost completely black. Their head is more or less uniform brown colour. Cottonmouth Snakes are heavy bodied with keeled scales. Eastern populations have broad dark post ocular stripes, bordered with pale pigment above and below, which is faint or absent in western populations. The underside of the head is generally whitish, cream or tan. 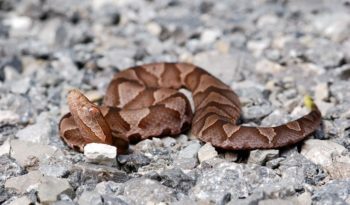 Juvenile Cottonmouth snakes generally have a more contrasting colour pattern, with dark cross bands on a lighter ground colour. The ground colour is either tan, brown or reddish brown. The tip of the tail is usually yellowish, becoming greenish yellow or greenish in sub adults and then black in adults. On some juveniles, the banding pattern can also be seen on the tail. Cottonmouth snakes are rarely found far from a permanent water source, such as a slow moving stream, edge of a lake, pond, swamp, or even brackish tidal estuaries. 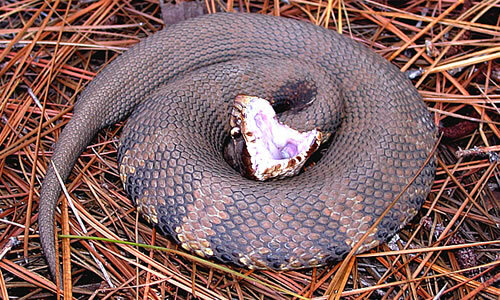 Throughout much of their range, Cottonmouth Snakes are found in open flat wood pine forests or bald cypress swamps. Cottonmouth Snakes can be aggressive. Unlike their Copperhead cousins, they will often stand their ground. Cottonmouth Snakes venom is stronger and they tend to be larger snakes, making them very dangerous. 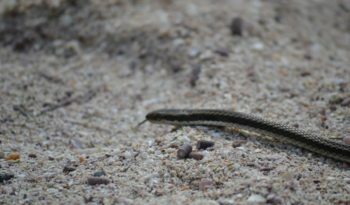 However, in tests designed to measure the suite of behavioural responses by free-ranging cottonmouths to encounters with humans, 51 percent of the test subjects tried to escape and 78 percent used threat displays or other defensive tactics. Only when the snakes were picked up with a mechanical hand were they likely to bite. When startled the cottonmouth snake will often stand its ground and open its mouth (‘gape’ or ‘smile’) to warn predators to stay away. This behaviour is seen many times as aggressive, however, if left alone they will just slip away. Cottonmouth Snakes swim with much of their bodies floating above the surface distinguishing them from water snakes, which tend to swim mostly below the surface, sometimes with their heads protruding. Cottonmouth Snakes take a wide variety of prey including fish, small mammals, lizards, birds, small turtles, baby alligators and even other snakes. Usually a victim is envenomed quickly with a bite and then released. If the prey does not succumb immediately, it is tracked by scent. 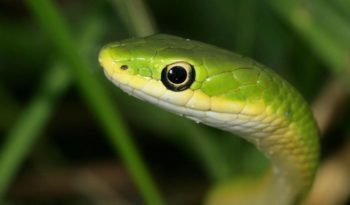 Like all pit vipers, the Cottonmouth Snake has pits on the sides of its nose that sense body heat of warm blooded animals in the form of infrared light, therefore, its hunting ability is not impaired at night. The name ‘cottonmouth’ is earned by the snakes tendency to open its mouth widely, displaying white tissue inside as a warning gesture. The Cottonmouth snake breeds in spring and Autumn and is ovoviviparous (development within eggs that remain within the mothers body up until they hatch or are about to hatch). Cottonmouth Snakes give birth to 10 or so live young after a 3 month gestation period. The young average around 20 centimetres in length. There is little or no maternal care. Juvenile cottonmouths use their bright colour on the tip of their tail as a lure to entice prey items to approach within striking range. As they mature, this tail colour fades along with the associated behaviour. 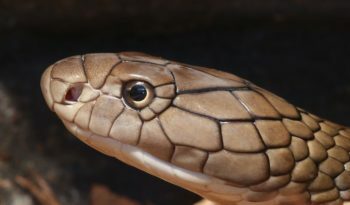 The venom of the Cottonmouth Snake is hemotoxic (toxins that destroy red blood cells), causing swelling and necrosis (accidental death of cells and living tissue) near the site of the wound and potentially death of the victim if treatment is not received promptly. 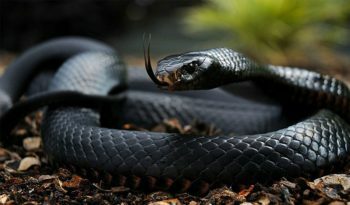 The venom is more toxic than its close cousin the Copperhead snake, however, it is nowhere near as toxic as Rattlesnakes and other vipers. The Cottonmouth snake is capable of inflicting what is referred to as a ‘dry bite’, where no venom is injected, however, any bite from a venomous snake should be treated as serious and immediate medical attention sought, even if no immediate effects from the venom are felt. 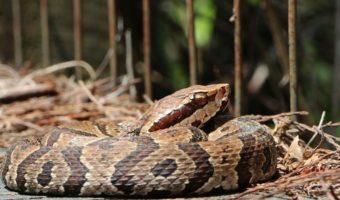 Compared to other venomous snake species in its geographic range, the venom of a Cottonmouth snake is relatively weak and is unlikely to kill an otherwise healthy human adult. The bite however is extremely painful, prone to gangrene and loss of digits without adequate treatment.